Does it take a green thumb to grow a five foot tall hibiscus with a 10 inch bloom? Nope, all hibiscus need to flourish is full sun and consistently moist, well drained soil. Common Names: Rose Mallow, Swamp Mallow, Hardy Hibiscus, Dinner-Plate Hibiscus, Fleming hybrid Hibiscus, or Perennial Hibiscus. Hardiness Zones: 4 to 9; Hardy to -30F degrees. A hardy perennial that is categorized as a deciduous woody shrub, but produces large blooms that are similar to tropical Hibiscus rosa-sinensis. watered will result in larger flowers and lush foliage. Do not over-water dormant plants, but after dormancy is broken, do not let plants wilt. Provided with organic soil (or a fertilizer application in the spring) and plenty of water. Fertilizer should not be used after June to ensure that the hibiscus flower production is not impeded by excess nitrogen. To encourage branching, pinch plants back when new shoots are 2 inches long. Do not pinch all the way back to the hardwood portion of the stem. It is best to plant Hibiscus in the garden before the heat of the summer arrives. Hibiscus should be heavily mulched the first winter. In spring, cut back any remaining stems before new growth appears. Hibiscus can be used in the garden as focal point, as a border or arranged to provide an informal hedge. Some perennial hibiscus plants are compact and some habits are taller. 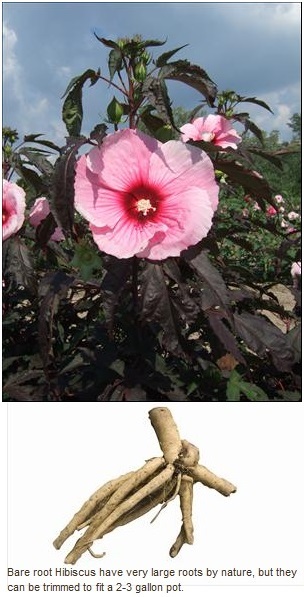 Perennial Hibiscus plants have no severe pest or disease problems.